I will start by begging preemptive forgiveness for anything awkward, inelegant, or, God forbid, downright problematic that I might write in this review. As I have said before, in fractious times such as these, I pray for films that stare down injustice, thrust oppressed perspectives into the foreground, and force us to engage with how we can do better by our fellow human beings. And I pray for such films for the very same reason that I often tremble at reviewing them. What often makes films like those brilliant is their ability to shine a floodlight on the comfortable status quo, and the comfortable status quo is certainly what I am. If I am watching a film with righteous power and scathing social insights, there is a very good chance that my own failings are right there in the crosshairs, staring back at me like shifty rodents. My privileged background, my protected skin color, my roundly accepted sexual orientation, and my own complicit cowardice. And if a film like Mudbound were not already eloquent enough at exposing the daily benefits I enjoy, then writing a review of this honest, ravishingly poetic portrait of America’s racial divide will surely finish me off. Allow me to strike the first blow against myself by presenting an inherently problematic idea. Art can be a Trojan Horse for just, humane ideas. It was a thought I remember having when I watched Ryan Coogler’s Creed a few years back. The immensely talented young black filmmaker set out to make the latest entry in the Rocky franchise and, as far as I’m concerned, gave the series its clear best film. I sat and watched the film with an enthralled, mostly white crowd in Danville, California, close to where I grew up. And, to be fair, I had no idea what any of the audience’s thoughts on race were, or their views on any particular social movement, or whether they considered racism to be a pressing modern day crisis. But I thought of Roger Ebert’s theory on movies as empathy machines and I watched a crowd of happy, enthusiastic, damp Caucasian faces leave the theater thoroughly moved by the story of a young black man coming to grips with his familial history and finding a reason to be proud of himself. And, please pardon my cynicism, but I do not think that even a quarter of those people would have been there to meet Adonis Creed and have that positive movie experience if the film was not part of a famous, popular boxing franchise. The Trojan Horse of a rousing, well-reviewed sports movie had smuggled in a sweet, frank, observant black coming-of-age story and slipped it under the guard of people who have likely not shown up just to see a young African-American man learning discipline and self-love as he becomes an adult in a new city. And now I am literally blushing with embarrassment for what I have just suggested. Because I know in my soul that this Trojan Horse theory is (and there is no better word) a fucked-up notion. Black narratives deserve to be told, and not just the ones that are charming and life-affirming, and certainly not just the ones that are agreeably packaged. It goes without saying that we should not need to sneak ideas about the dignity and self-worth of African-Americans in to the mainstream under the disguise of film tropes that are more traditional, palatable, or generally popular. But, with all that said, the bones of old standbys and reliably well-liked genres are there for any filmmaker who wants to use them. To sneak insights and new perspectives past our privileged guards. To get around our blinders and reinvigorate our empathy. To fool us into engaging with our better angels, the same way you might fool an infant into eating its peas. And it’s all very unfortunate that such measures are necessary, but I am glad that such measures exist. I do think this ability to place critical ideas inside a popular form of storytelling is a large part of the genius of Dee Rees’ Mudbound. Rees is an African-American woman and one of a few directors in 2017 to make rigorous, beautiful, compelling films about the experience of being black in America. Rees’ film is very upfront in being about racial disparities, but it dresses itself in the disarming classical finery of the old-fashioned Hollywood epic film. Rees knows that Americans have always had a soft spot for the prestige and massive scope of a big, lush period piece, and she has created the very best big, lush period piece since at least 2016’s Sunset Song. Based off of Hillary Jordan’s 2008 novel of the same name, Mudbound is the story of two families of sharecroppers tending to the same muddy plot of land in rural 1940s Mississippi. One family is black, the other is white, and we get to know all of their members very well over the course of two hours and fifteen minutes. The black family is the Jacksons, lovingly overseen by its gruff, kind patriarch, Hap (played exquisitely by Rob Morgan). Hap is a man constantly protecting the flame of his dignity from the howling wind of Mississippi bigotry; a man wo has learned to weather the ever-present racism of this corner of the world but has never felt right or easy about the stooping it demands. His wife, Florence (Mary J. Blige, in a quietly lovely, sensitive, Oscar-nominated performance) feels as wounded as Hap does about the sacrifice and soul-sapping compromise of surviving this time and place, but she moves with this treacherous landscape with a kind of understated grace. Florence is a figure of both beautiful strength and sad resignation, focused on the safety and well-being of her family and acutely aware that shepherding them through this cruel country will require a daily denial of herself. The Jacksons have been diligently working their rented patch of land for decades, hoping to one day purchase it, when their white co-tenants, the McAllans, arrive. The head of the household is Henry McAllan (Jason Clarke, doing fine, solid work in what is probably the film’s most thankless role), a stubborn, taciturn company man who has uprooted his wife and infant daughter from their quiet, suburban lives to pursue a dream, or more truthfully a sudden whim, of becoming a farmer. His wife, Laura (a very strong performance that only looks effortless because it’s coming from Carey Mulligan), insists that she never knew anything of her husband’s agrarian aspirations. Their marriage seems to be one built more on material need and mutual companionship than on any real sense of love. It certainly does not seem to be built on communication. Laura is a woman of some sensitivity and culture, which leads her to have a much deeper bond with Henry’s charismatic, university-educated younger brother, Jamie (Garrett Hedlund, originally of Tron fame). Hedlund here sheds all of his handsome lunkhead persona to give one of this phenomenally acted film’s two best performances. The film’s most poignant and perfectly acted character is the Jackson family’s eldest son, Ronsell (Jason Mitchell, who has already been terrific as Eazy-E in Straight Outta Compton and seems to only be hitting his stride). Ronsell and Jamie spend at least half of the film separated from their respective families, as both volunteer to fight overseas in World War II, Jamie as a bomber pilot and Ronsell as a tank commander. Finally, there is Henry’s despicable, seething bigot of a father, Pappy (the great Jonathan Banks, of Breaking Bad fame), who Henry has invited to live with them, to the utter dismay and disgust of his wife. Pappy is an irredeemable, unrepentant open sewer of hate and hurt, unflagging in his contempt for any non-white person and incapable of the slightest show of warmth or mild fondness toward his long-suffering family. The main thrust of the film are the parallel, diverging, and dovetailing stories of this large ensemble. The story begins in earnest when Henry shows up at the doorway of a nice single-story house in town, telling the confused owner that he gave a man $200 for an oral agreement to purchase the property. As fate would have it, that man immediately sold the house to the man now standing in the doorway and hastily left town, leaving Henry with no deed, no house, and $200 less to his name. “You got swindled,” Pappy sneers at him. With scan options and very little money, Henry moves his family out to the Jacksons plot to sharecrop there. Henry McAllan makes his introduction by interrupting the Jackson family’s dinner and coercing Hap into helping him unpack in the middle of the night, while a not remotely grateful Pappy glares at him through suspecting eyes. And while there is a great deal of plot that unfolds in dense, rich detail, the film is really just the story of how all these people coexist and drift around each other’s orbit. Mudbound is chiefly the story of these two poor families with different skin colors, eking out a meager existence in the nation’s most racist state in the years during and immediately following the Second World War. Eventually, Jamie and Ronsell come home from battle and rejoin the main narrative, bringing with them an understanding that the fascist battlefields of 1940s Germany are more turbulent and in some ways more hospitable than the farmlands of the 1940s American South. And this very detailed synopsis, or more pointedly the fact that it does not even begin to sum up the film, should give you a sense of what a full-throated, staggeringly epic film Mudbound is. It may sound daunting, and I will concede that I finished both my viewings emotionally spent. But what I want to convey is just how soulful, heartfelt and alive Mudbound is; how filigreed it is with color, sound, dialogue, poetry, and richly observed characters. I would like to revisit the notion of the artistic Trojan Horse and temper it a bit where Mudbound is concerned. Because it is not quite right to say that Dee Rees is using the historical epic to disguise her interest in racial strife. Anyone who reads that Mudbound involves a family of black sharecroppers in 1940s Mississippi and does not expect to encounter the issue of racism probably needs to refamiliarize themselves with American history, or Mississippi history at the very least. It’s not that the trappings of the big, beautiful historical epic really hides any of the issues that Rees is confronting. It is more accurate to say that the sensory pleasure of watching Mudbound and being transported to its time and place is so exquisitely mounted that it becomes something of a mandatory viewing experience for anyone who just enjoys a lavish, meticulously curated historical drama. Mudbound is not quite the longest film on my year-end list, but it is certainly the one that feels the most overwhelmingly detailed. Like last year’s Sunset Song, its epic Irish cousin, part of Mudbound’s accomplishment is in making the dust and grime of an arduous agrarian lifestyle look so ruggedly beautiful. Moreover, it is an honest kind of beauty. The images of flooded fields and green trees popping against the dark brown landscape and every possible shade of that titular mud are all gorgeous, but in a way that never lets you forget how taxing it must have been to hoe and till and hack at this stubborn land. And the wealth of detail only begins with Rachel Morrison’s (the first woman ever nominated for a Cinematography Oscar) lusciously stark lensing. Those stunning images take place in a vast, unfurling tapestry of a story, populated by no less than six major characters, each of whom stake their claim to being the film’s key protagonist. I am wary of overusing the word “novelistic”, but it is not simply an accurate descriptor for Mudbound; it is the essential adjective. Mudboundis a film to give words like “dense” and “overwhelming” a good name. It is a hearty cinematic meal, to be sure, but it does not feel bloated or stretched thing, the way so many of its historical epic brethren do. It proceeds patiently, but each scene, beat, and frame feels immediate. 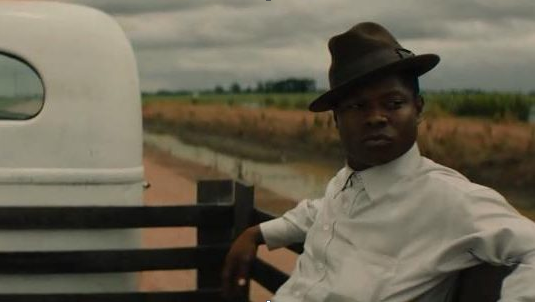 In rewatching Mudbound, I took so much time noting poetic turns of phrase that I would momentarily forget to not its lovely frames and saturated color palette. Then, when I stopped to feebly try to write something about the grit and grandeur of the images, I would struggle to capture the vividness of its lyrical, powerful screenplay. Very little time passes over Mudbound’s 135 minutes when it is not simultaneously one of the most splendidly composed and sumptuously written films of the year. At a certain point, I had to limit my note-taking and just trust my memory to do its humble best. To fully honor its shots, I would need a giant coffee table photography book. To fully capture its florid, soulful writing, I would essentially have to rewrite its script. The only true way to experience the splendor and immense emotional undertow of Mudbound is to take it in with your own eyes and ears. All this lovely detail, both visual and verbal, enables me to sincerely applaud Mudbound as the vwery best kind of grand, sprawling, old-fashioned film. It’s the kind of epic they scarcely make anymore and that were rarely made with such vibrant detail when they did make them. But Mudbound is also a thematically rich work, which gives it a kind of cerebral heft that is even more rare in the prestigious historical dramas that are its contemporaries. The themes of Mudbound largely fall into a discourse between the nation that binds us together and the persistent racial prejudice that overpowers that sense of national unity. The idea of unity is represented through the notion of mud, dirt, and land, which are constant motifs throughout the film. Mudbound opens with a scene set late into its narrative, as Henry and Jamie plunging shovels into the thick Mississippi mud. Pappy has died and they are rushing to dig a grave for him before a heavy rainstorm floods the grave. As they dig deeper, Henry finds another body from many decades ago. There are manacles next to the skeleton and the skull has been pierced by a bullet hole. Henry and Jamie have found the old grave of a runaway slave. Henry insists that Pappy would recoil at being buried in the same resting place as a slave, but the old racist is dead and there is no time to start digging anew. So Pappy is laid to rest in the same place as a man who he would have called beneath him. The poignant, acerbic idea of this scene, and of Mudbound in general, is that all the struggle and injustice and bloodshed throughout the centuries, from the beginning of slavery to the present-day, is all tied to the soil of this one single place we call a country. It is an idea that sounds almost too simple, but Rees’ sense for tone and character, and the beautiful prose of her source material tease this idea out thoughtfully until it becomes a thing of elegiac resonance. Rees is not saying something so facile as that all the racial divisions between white and black Americans are smoothed out over the simple sharing of a piece of land, be it a grave or a country. But I believe she is positing that, no matter what happens, being countrymen fates us to share a story. Pappy’s story, in the end, is that for all his hate and his feelings of superiority over anyone who didn’t look like him, he was always fated to die and come to rest in the same mud as the people he despised and tormented. And the land will now keep his final chapter and hold it together with the final chapter of that murdered slave, and if anyone comes digging decades later, they will find that 19th century skeleton in his shackles right next to that spiteful cur who died in the 1940s and that will be fitting. Not because time makes things okay and not because in death they are not so different, but because those two people, and so many other slaves, masters, victims, and aggressors are part of the same blood-soaked book. And now the illusion of time, probably only some 80 years anyway, can be shattered and the constant Earth can hold Pappy and this slave right next to each other where they belong. It can keep the two side by side, one shot and unceremoniously dumped here like an animal and the other laid here in a cheap wood coffin, far better than he deserved but all the better to evidence a blunt truth of this American epic we are penning. That not every dead soul in this country got to be buried by its family, and not every man was afforded the right to die decently. Mudbound has plenty to say about the different path black Americans have had to walk, but it is also saying something poignant, disturbing, and scathing about how Americans of every race are bound together in the same violent, leather-bound tome; the same national narrative. The other voice in Mudbound’s direct but nuanced conversation is the one that knows a sense of unity has always been something of an American myth. The folly of that myth is there in the repeated motif of the Jackson family’s interrupted dinners. The black family’s sanctuary of peace and loving kinship is repeatedly invaded by the loud knocking of the McAllan patriarch, insisting on some favor or bit of assistance from Hap or Florence. And the mixture of frustration and wounded pride we see wash over Hap’s face lays the truth bare, that even some 80 years after Abolition, Hap and his family are at this insignificant white man’s beck and call. And the possibility that Henry McAllan doesn’t quite register the coercive sway he holds over the Jacksons makes this imbalance all the more insidious, infuriating, and scary. It is present in the way Florence swallows her pride and accepts work caring for the McAllan children, optimistically telling herself the extra money will be good for her family. Still, she reminisces in voiceover about how her own mother spent her daylight hours tending to white babies while her young daughter mostly had to settle for seeing her in the dark. Mudbound is about the sad, aggravating truth of what it has meant, and still means, to be black in this country, and how easy it is for a group of people to brush that truth aside or ignore it when they do not have to live with it day after day. The McAllans and the Jacksons both live hard, dirty lives, but the problem is that this shared hardship makes it too easy for the McAllans to live in ignorance of how much more strenuous this grueling lifestyle is for a black family. Both households go to bed with grubby fingers and throbbing muscles, but the Jacksons also have to tend to a constant ache in their spirits. The McAllan’s myopia even extends to the most enlightened member of the family, Jamie. And it is here where I believe Dee Rees feel the most anguish about the sweet sincere hope for understanding and friendship across the racial divide and how it just cannot be that simple. Not in this country with this history and these sins buried in its soil. The friendship between Jamie McAllan and Ronsell Jackson is the emotional lynchpin of Mudbound, which is quite a feat considering that the two do not meet until 90 minutes into the film and everything that comes before that is beautiful and powerful and completely moving. But those scenes of the two returned soldiers, played with such exquisite empathy by Jason Mitchell and Garret Hedlund, allow Mudbound to be both a prayer for hope and brotherhood and an unflinching account of how hope can also be a scary thing. Ronsell and Jamie’s connection, their shared empathy over the horrors they have seen, and the sudden appreciation each one feels for having found a kindred spirit made me beam and wince all at once. Because even something as intuitive and natural as two good men becoming friends cannot entirely escape the corrosion of the toxic air around it. And the most damning, emotionally gutting thing about their arc together is how even a smart, compassionate man like Jamie cannot quite grasp Ronsell’s reality. He cannot quite see that, even as an educated, benign white man, he poses a danger to his dear black friend. 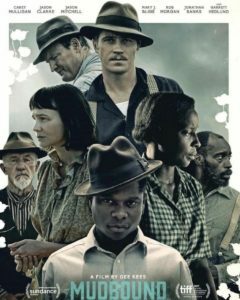 Mudbound is about the experience of being black in American, but it is also a very effective critique of the full gamut of white ignorance: from Pappy’s bilious racism, through Henry’s apathy and Laura’s well-intentioned equivocating, to the naivete of someone like Jamie thinking they can glide over centuries of entrenched bigotry just by being one of the good ones. Through all of this, Mudbound holds on to traces of optimism. Though the story goes to some unspeakably tragic places, it has hope its heart. But if that hope is to mean anything, it must be clear-eyed, and that means recognizing that our problems have never been one and the same. This country’s best hopes won’t be realized until the last of us stops trying to pretending otherwise. Mudbound plays beautifully as an amazingly well-acted, gorgeously detailed American epic with just a touch more arsenic in its veins. And maybe part of that is using the appealing form of a large ensemble epic to house subversive, trenchant ideas that are not always present in films of this kind. At the same time, I do not feel Rees is attempting a deception here. I think the moral is that, for the 200-plus year American saga, this idea of a land that unites with one hand and divides with the other, has always been in the very text of the story. If it has been more implicit and less pronounced in the past, then perhaps it is time we told the story of this country more candidly. Even Mudbound’s musical score feels like the vibrant, subversive hybrid of something both familiar and radical. The guitar strings and low tones evoke the muck and dusty, hot days of a Mississippi summer, but there are subtle tweaks that make the melodies sound discordant, almost decaying. It sounds like an acoustic blues band sinking slowly into a swamp. Mudbound is an old song sung not necessarily in a modern way, but with an awareness of the present day and how little has really changed in the decades between. Many of the same old stories are being told. But what is blessedly changing, however slowly, is the diverse range of people who are now able to tell those stories. In 2017, I watched an old-style, swelling Southern historical epic. It was not the first time I had seen that kind of movie, but this time a black woman was behind the camera. And that, as it turns out, makes a world of difference.